The rise of American product design through Jazz Age exuberance, economic depression and post-war prosperity is the story that is told through the Elgin American company and its remarkable range of ladies’ compacts. The compact was a symbol of modernity, bursting into American life in the Roaring 20s as an essential prop of liberated young flappers, Compacts were meant for public display, signaling their owners’ style and status, and appearance was their key feature. Elgin American was a leader in this market. CADS member Jackie Vossler received an award from the City of Elgin for this exhibit. 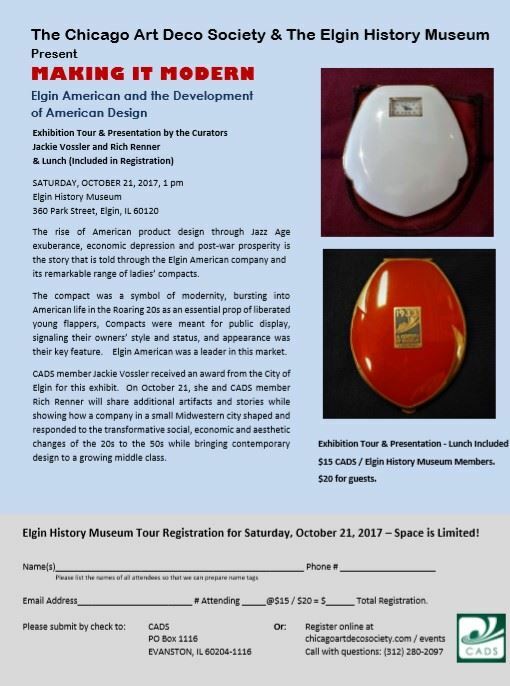 On October 21, she and CADS member Rich Renner will share additional artifacts and stories while showing how a company in a small Midwestern city shaped and responded to the transformative social, economic and aesthetic changes of the 20s to the 50s while bringing contemporary design to a growing middle class.